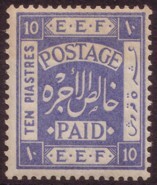 Though preparations for a regular series of postage stamps had started as early as 1917, only the two lithographed values of 1p and 5m (see previous page: The Blues) had been issued at the end of the postage free period. The official approval by the Foreign Office and the Director Of Army Postal Services in London was delayed until May 1918. The first delivery from Cairo (14.06.1918) reached Jerusalem by mid-July. On 16.07.1918 the new values of 1m, 2m, 4m, 2p, and 5p were issued. 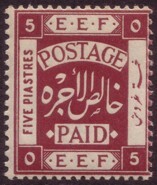 Following this initial issue of five new values, further stamps were issued in installments. The lithographed Blues were replaced in September and November: the 5m on 25.09.1918 and the 1p on 9.11.1918. Further new values were released on 17.12.1918 (3m, 9p, and 10p) and the highest values of 20p was issued on 27.12.1918. 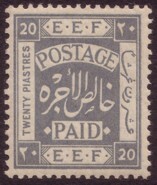 The stamps of this series were continually reprinted until 1927. After the establishment of the civil administration under High Commissioner Sir Herbert Samuel (1.07.1920) trilingual overprints were furnished for use in Palestine (Arab, English, Hebrew) and a monolingual overprint (Arab) for use in new separated Transjordan. 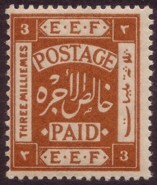 Sale of un-overprinted stamps ended in Palestine by 31.08.1920, invalidation was decreed for 1.05.1922. 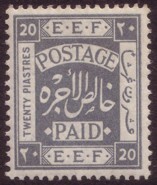 In Transjordan sale ended with the issue of the locally overprinted values in November 1920. 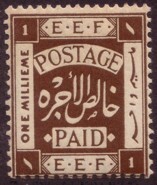 Usage in Syria (23.09.1918--23.03.1922) and Lebanon (21.09.1918--September 1920) was terminated by new stamps provided by French authorities, though sale itself ended in 1919. 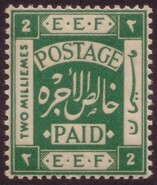 In Cilicia EEF-stamps were used between 21.10.1919 and 16.07.1920. Invalidation was decreed for all these territories for 1.05.1922. 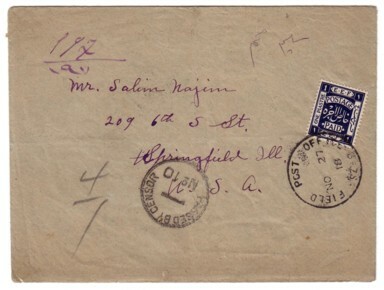 Letter sent during the period when the first values of the Typo series had been issued, but not the new 1p stamp: SG nos. 3, 5, 6, and 11, all tied by a parcel post handstamp ARMY / POST OFFICE (Sacher A3, Firebrace PCH4). Registration label for SZ44 office with manulal corrected registration number: ARMY POST OFFICE / SZ 44 / A / 28JY18. 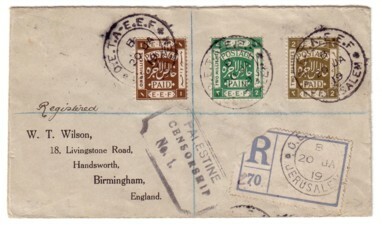 Censor handstamp: PALESTINE / CENSORSHIP / No. 2 (Sacher QA14, Firebrace PCC2/4). 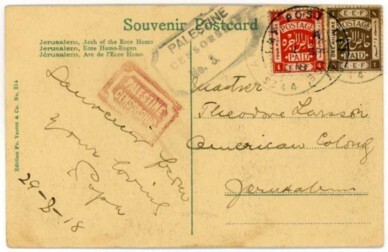 Locally sent postcard, Jerusalem: SG nos. 8 and 5 cancelled by ARMY POST OFFICE / SZ 44 / A / 1 SP / 18. The card is bearing two censor handstamps: the regular black PALESTINE / CENSORSHIP / No. 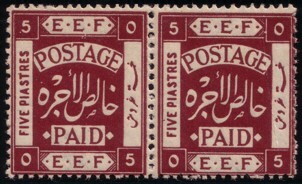 3 (Firebace PCC3/3, Sacher QA17) and a much rarer negative red seal PALESTINE / CENSORSHIP (Firebrace CIM23). The former is situated at Bir Salem HQ, the latter with APO SZ44. 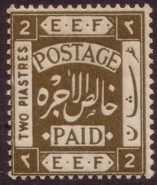 Single franking of 2p, SG no. 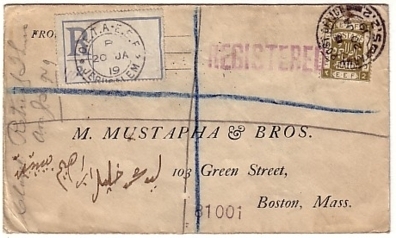 11, on a registered letter to Boston. 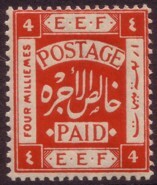 Stamp cancelled by ARMY POST OFFICE / S.Z.2 / [?] / 20 JA / 19, registration label O.E.T.A·E.E.F. / JERUSALEM / B / 20 / JA / 19 (Sacher A7). 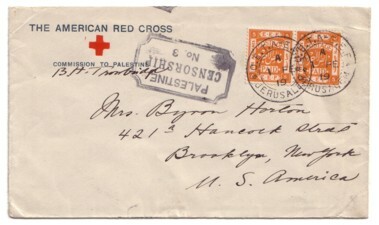 On reverese: FIELD POST OFFICE / GM1 / A / 21 JA / 19, FIELD POST OFFICE / GM1 / A / 22 JA / 19, censor handstamp PALESTINE / CENSORSHIP / No. 1 (Firebrace PCC1/1), and two arrival marks from Boston (26.02.1919). Commercial cover. SG no. 10 cancelled with HALEP / 3 / 23.7.19 to Moksdorf (Saxony) and redirected to Schweizerthal. On back censorship mark: LA CENSURE MILITAIRE / HALEP and censor's signature. 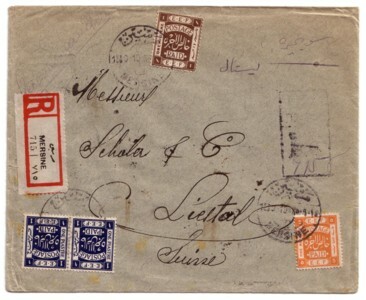 Registered cover from Cilicia. SG nos. 5, 9 and 10 (in pair) cancelled with MERSINE / [?] / 15.9.19 to Liestal (Switzerland). 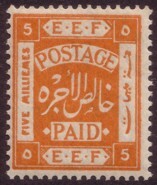 Registration mark with pencilled-in 715 and additional registration label MERSINE / 715. On back arrival marks: LIESTAL / 12.X.19-7. 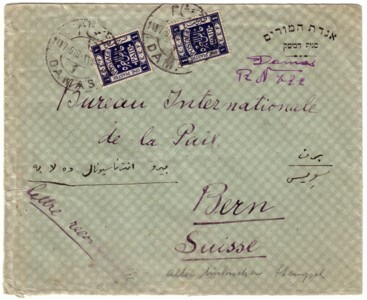 Registered letter from Damascus to Switzerland. SG no. 10 (twice) cancelled with DAMAS / 1 / 14 7-919*. Handwritten registration mark Damas / R N 722. On reverse transit mark PORT-SAID / R / 17JL 19 2 30 P und arrival mark BERN / BRIEFTRÄGER / 23.VII.19. 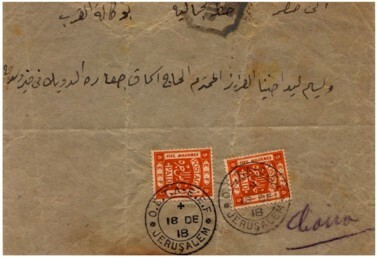 Letter from Jerusalem to Cairo. SG no. 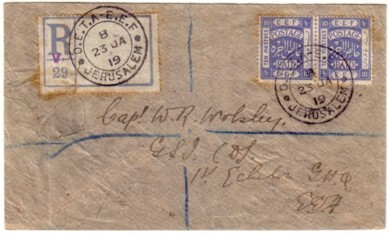 9 (twice) cancelled with postmark O.E.T.A-E.E.F / JERUSALEM / + / 18 DE / 18 (Sacher A6). On reverse arrival mark Cairo / 22.XII 18 and censor label A.F.W. 3424 / Opened / by / Censor / [...] (Sacher QA4). Image and description courtesy of Thomas Schubert. 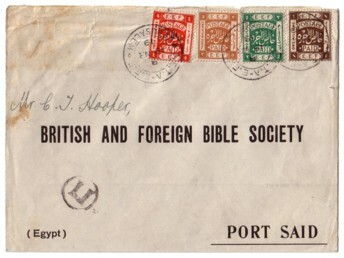 Letter to Port Said with franking of 1, 2, 3 und 4m (SG nos. 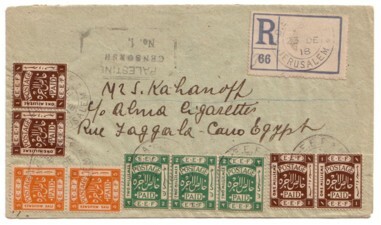 5, 6, 7, 8) cancelled by O.E.T.A-E.E.F / JERUSALEM / B / 19 MR / 19 (Sacher A6). On reverse transit marking Port Said ARMY POST OFFICE / A / SZ 22 / 22 MR / 19) and civil arrival mark PORT SAID / F / 22.III.19 12--. 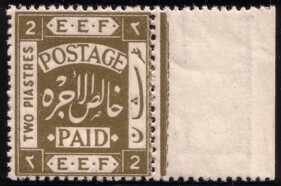 Egyption censor mark on front, unknown mark on reverse side. Registered cover (domestic rate) with SG no. 5 (two pairs), no. 6 (strip of three) and no. 9 (vertical pair). 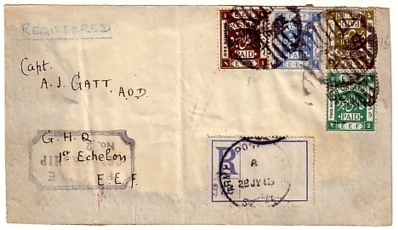 Postmark O.E.T.A-E.E.F / JERUSALEM / B / 23 DE / 18 (Sacher A6), five strikes on front, one on back, plus strike on the registration label (Sacher RB, altered in pencil from 66 auf 366). Censor mark PALESTINE / CENSORSHIP / No. 1. (Firebrace PCC1/1, pictured but not listed by Sacher). On reverse transit marks at Jerusalem FIELD POST OFFICE / GM1 / 25 DE 18 (type L) and Cairo ARMY POST OFFICE / S.Z. 10 / 26-DE-18 (type D) as well as civil arrival mark CAIRO / R / 26.XII.184.-PM. Registered cover (overseas rate) with SG nos. 5, 6 and 11. Cancelled by O.E.T.A-E.E.F / JERUSALEM / B / 20 JA / 19 (Sacher A6), three strikes on front, one on back, plus strike on the registration label (Sacher RB, altered in pencil from 70 to 270). Censored with markiing PALESTINE / CENSORSHIP / No. 1. (Firebrace PCC1/1, pictured but not listed by Sacher). On reverse side transit postmark of Jerusalem FIELD POST OFFICE / GM1 / 21 JA 19 (type L) and London (red fragment) REGISTERED / LONDON / 38 / [?] FE [...]. Overseaes postcard with SG no. 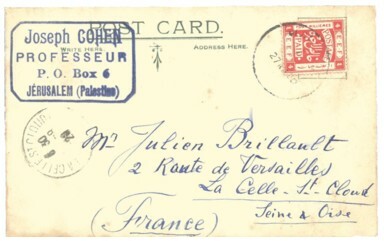 8, Palestine to France: JERUSALEM / 27 AU 20. Arrival mark: LA CELLE ST. CLOUD / 30 / -8 / 20. Image: ebay. 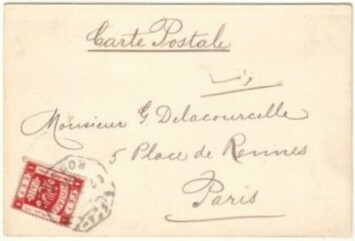 Another card, now from Homs to Paris, SG no. 8, date unclear (1919). Image: ebay. Overseas letter destined for New York with pair of SG no. 9. 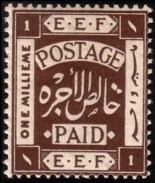 Postmark O.E.T.A-E.E.F / JERUSALEM / A / 1 FE / 19 (Sacher A6) and censorship marking PALESTINE / CENSORSHIP / No. 3 (Sacher QA15). Another pair of SG no. 9 used over a year later. 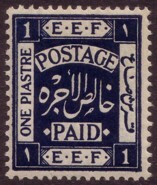 By that time postmarks had been adapated by excising "O.E.T.A.-E.E.F. ": HAIFA / + / 16 AU / 20 (Sacher B16, adapted A15). Note that Sacher lists index "+" only with A15, not B16 itself. 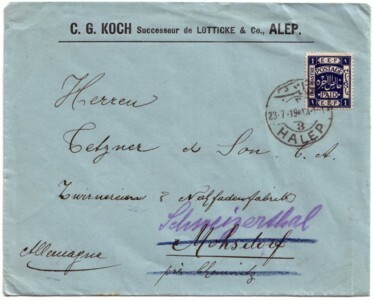 Private registered letter addressed to an officer in "1st Echelon EEF", franked with a vertical pair of SG no. 14. 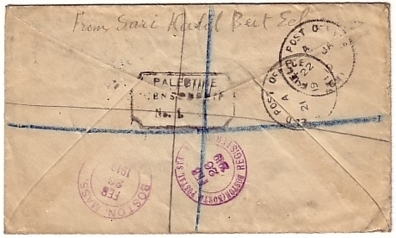 Postmark: O.E.T.A-E.E.F / JERUSALEM / B / 23 JA / 19 (Sacher A6). No censorship marks. Registration label (Sacher RB) with violet handstamp V.
On reverse side arrival mark FIELD POST OFFICE / GM1 / 24 JA 19. A registered letter would have cost only 1½p; without any reason this letter was overpaid by almost ten times that charge! The registration label has been "cancelled" on cover. A new design (T3), based on the original one by Lt. Rowntree, was used for the typographed issue. Besides ciphers in the corners, English (left) and Arab (right) numerals appear in the side-panels. Curiously the Arab numerals on all but three values (1p, 9p, 20p) run the wrong way around: downwards rather than upwards. 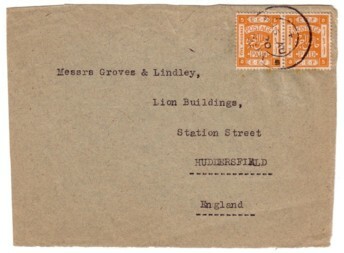 Printing was executed by the Stamping Department, Board of Inland Revenue, Somerset House, London in typography on regular paper with watermark W100 (Royal Cipher in Column) and a large watermark POSTAGE running on the left and right margin. Each printing sheet consists of two block of 120 stamps (12x10) each, separated by Intersecting Gutters in type A. Guide dots are found in the centre of the top and bottom of a sheet; the entire plate is surrounded by Jubilee Lines. Unlike previous prints, no control numbers appear at the sheet corners. 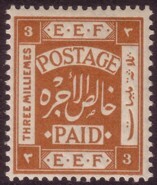 The values issued on 16.07.1918 (1m, 2m, 4m, 2p, and 5p) use design T3 in size (a) 19 1/4 x 23mm. The next values (1p, 3m, 9p, 10p, 5m, and 20p) have a design size (b) of 18 1/4 (to 18 1/2) x 21 3/4 (to 22mm). The size of the actual stamp though remained stable at 20 1/2 x 24mm. The comb perforation measures 14 3/4 (to 15) x 14; the top and right margins are perforated through. 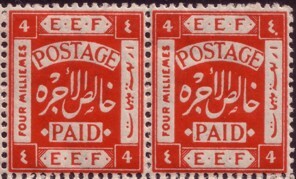 Perforation: prints from 1919 and 1920 can have a rather "rough" perforation RP (1m, 2m, 3m, 4m, 5m, 1p, 2p, 5p). Prints from October 1918 are mis-perforated in the bottom row: fields 229-240 are missing the third hole from right MP (1m, 2m, 4m, 5m, and 1p).